As has been the case for about a month, the media’s campaign narrative last week proceeded on two tracks. Track one was the fiercely passionate endgame to the Democrats’ long and hard-fought nomination battle. The other was the developing general election campaign between John McCain and Barack Obama. And in that story line, the Iraq war began to move back onto center stage. On the Democratic primary side, matters came to a head on May 31 with a televised session of the Democratic National Committee’s Rules & Bylaws Committee as it decided how to count the disputed Florida and Michigan primaries The next day’s Puerto Rico primary—won in a landslide by Hillary Clinton—was treated by the media largely as an anti-climatic vote that did not derail the expectation that Obama would soon claim the requisite number of delegates. As he has in most weeks, Obama led Clinton in the race for media exposure, appearing as a significant or dominant newsmaker in 66% of the campaign stories compared with 45% for Clinton, according to PEJ’s Campaign Coverage Index for May 26-June 1. A good chunk of that coverage late in the week came from another pastor problem, with Obama resigning from his church after Father Michael Pfleger made mocking remarks about Clinton there. All told, Obama’s latest church flap accounted for 13% of all the campaign stories last week. But even more of the narrative drama last week revolved around the results of the DNC deliberations, which accounted for 16% of the week’s campaign stories. The distribution of delegates—which gave Clinton 24 more than Obama from those two states—left some of her supporters fighting mad. (The June 1 New York Times reported that one such backer inside the meeting room yelled out “McCain in 08! No-bama!”) Moreover, by week’s end the press was still speculating about whether Clinton would concede within days or possibly take the fight to the floor of the convention. As part of the general election, storyline, McCain continued his recent emergence as a headline maker, registering as a dominant or significant factor in 36% of the coverage—his second highest total since late February. 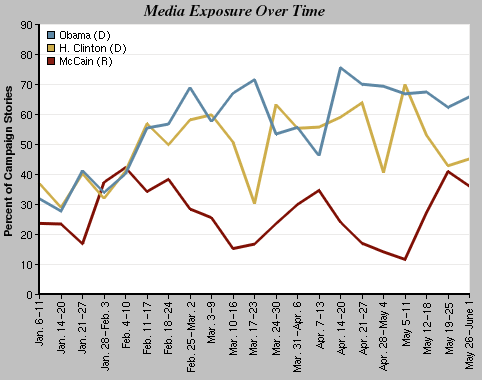 McCain’s uptick in coverage began several weeks ago, when President Bush’s appeasement speech drew the GOP candidate and Obama into an exchange over foreign policy. Last week, the McCain/Obama battle largely centered on one foreign policy issue—the war in Iraq—which accounted for 10% of the week’s election-related stories. Many in the media have noted the dramatic drop-off in Iraq coverage in recent months, a trend substantiated in PEJ’s News Coverage Index. 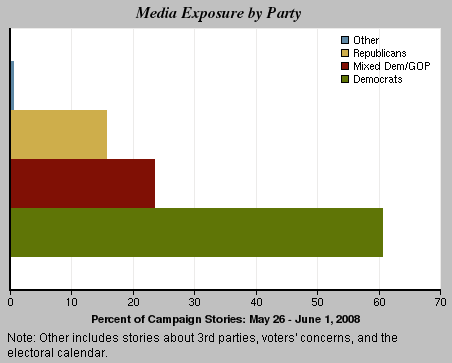 (For example, in May 2008, war coverage filled 3% of the overall newshole compared to 19% the same month a year earlier.) But the tone and tenor of last week’s exchanges between McCain and Obama suggest the war will emerge as a hot topic again in the general election. “The discussion about Iraq, largely sidelined during the primary battle, is likely to factor prominently in the general election,” declared a May 29 story posted on the AOL site that detailed the two candidates’ differences on the conflict. By accounting for only 27% of the newshole last week as measured by PEJ’s News Coverage Index, campaign coverage equaled its second-lowest level of the year. Last week’s blockbuster news that Scott McClellan, the formerly tight-lipped White House press aide, had written a memoir scathingly critical of the Bush administration was the No. 2 story, finishing at 14% of the newshole. The hot political story diverted some of the attention of the pundits and political writers who usually devote their full energies to the election. The Campaign Coverage Index is an addition to PEJ’s NCI report, which tracks what stories the media covered in the previous week. The CCI offers a greater level of detail of the campaign coverage. 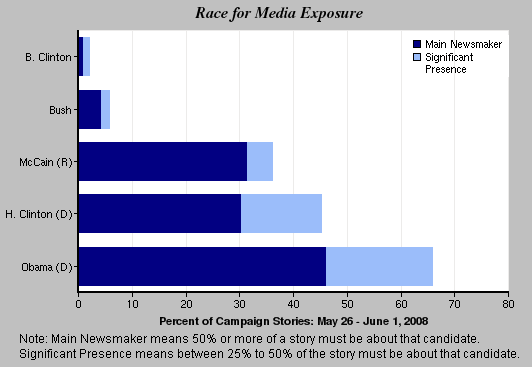 That includes the percentage of stories in which a candidate played a significant role (as a subject of between 25% and 50% of the story) or a main newsmaker role (making up at least 50% of the story). The Index also identifies the key narratives in the reporting and the “Line of the Week,” a statement from a journalist or source that in our researchers’ estimation seems either to capture the story or is particularly colorful. PEJ’s News Coverage Index will not disappear. It will come at the bottom of the CCI. If the consensus in media and political circles is right that the Democratic primary fight will effectively be over within days, then perhaps the most significant campaign story last week was the developing battle over Iraq policy between McCain and Obama. The week started with both candidates making Memorial Day appearances in New Mexico. Obama and McCain offered “starkly different approaches to the war in Iraq…in a state that could help decide” the election, declared NBC’s Andrea Mitchell on the May 27 Today show as she spelled out the divergent views of McCain, a staunch backer of the Iraq engagement, and Obama, an advocate for withdrawal. That same day, the Fox News Channel covered another aspect of the issue, as it reported on a small group of anti-war protestors who heckled McCain during a speech in Denver. “John McCain was trying to discuss nuclear security. But there was a group of people who clearly thought their freedom of speech trumps everyone else’s,” observed Fox anchor E. D. Hill. As numerous commentators have noted, Iraq seems to be an issue that both candidates think benefits them. The expectation is that the McCain campaign will use it to depict Obama as inexperienced and naïve about global threats while the Obama campaign will try and inextricably link McCain with an unpopular president, George Bush, prosecuting an unpopular war. Last week the political skirmishing over Iraq escalated noticeably. But that is probably only a preview of what awaits voters in the fall campaign. With former colleagues denouncing him as a turncoat and McClellan hitting the media circuit to defend himself, the political firestorm surrounding his book, “What Happened: Inside the Bush White House and Washington’s Culture of Deception,” propelled the story to No. 2 last week (at 14%), as measured by the News Coverage Index. It was a particularly hot topic on cable news, where it filled 28% of the newshole. (The campaign filled 43% on cable.) After that, there was a significant drop-off to the third-biggest story, the continuing aftermath of the earthquake in China, at 3%. That was followed by the U.S. economy (3%) and events inside Iraq (also 3%).